The first thing that people notice in any vehicle is usually its paint. The vehicle will invite stares, although not positive ones, if the finish is scratched, chipped, or dull. Midland Autobody is an auto paint shop that Midland, WA residents have trusted since 1962 to restore the original look and feel of their vehicles' paint. We are known for our exquisite workmanship in truck and car painting services. 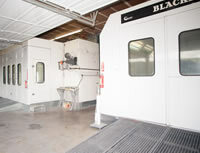 Our auto paint shop uses state-of-the-art computerized color-matching software to make sure that the auto painting work on every vehicle that enters our paint booth is precisely matched to its original color and finish. 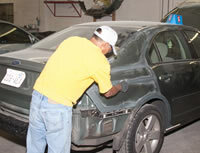 Need auto painting services to finish collision repairs on your vehicle? We can help. Our auto paint shop can fix any minor or extensive collision damage happening to the painted surface of a vehicle. You can trust us for the finest car painting services in the Midland area that make your accident-damaged vehicle look even better than it did before the crash. Whether your vehicle comes to our facility for a door panel paint job or for complete auto body painting, our car painting crew makes sure that the paint job is executed with 100% accuracy. We also provide fair and accurate car painting estimates to help you plan your budget for the job. Visit our BBB-accredited custom auto paint shop if you wish to enhance your driving experience by giving a new color and look to your vehicle. Hire our custom auto painting services if your Midland vehicle is sporting patches of rust or looking stained and splotchy. Call Midland Autobody at 253-581-0220 to discuss the car painting services your Midland vehicle needs.